Sweet marjoram essential oil is derived from the flowering tops of Origanum majorana, which is classified under the Labiatae family along with over 30 other species of ‘marjoram’ within the genus Origanum. This diversity among the so-called ‘marjorams’, together with the fact that origanums have been widely used for both medicinal and culinary purposes over many centuries has led to a certain amount of confusion regarding their correct identification. 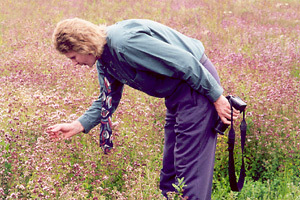 For example, Origanum vulgare (origano) and Origanum onites (pot marjoram) are both referred to as origanum or wild marjoram, and another essential oil extracted from Thymus mastichina is referred to as both ‘wild’ and ‘Spanish marjoram’ – despite the fact that this plant belongs to the Thyme family! This once again highlights the importance of referring to plants and oils by their botanical name, rather than by their common one. Especially when purchasing sweet marjoram essential oil! 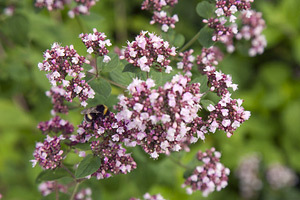 Also known as knotted marjoram, Origanum majorana is a frost-tender perennial plant which can grow to a height of 60 centimetres (24 inches), with oval leaves and pale or dark pink-purple flowers. These flowers are small but plentiful and form in spiky clusters, blooming between June and September. It is a warm climate plant, preferring lots of sun and well-drained soil. The whole plant is highly aromatic, exuding a pleasing peppery, warm and fresh fragrance of which Culpepper wrote ‘It helpeth all diseases of the chest which hinder the freeness of breathing’. The fresh and dried aromatic leaves have been used for centuries throughout the world as a condiment in cooking due to their spicy, pungent flavour. Originating from the Mediterranean and North Africa, marjoram spread far and wide reaching Egypt around 2000 BC, according to early records. The Egyptians dedicated marjoram to the god of the underworld, Osiris, and it was used as a funerary herb as well as to produce unguents, medicines and even love potions. The Greeks and Romans considered it the herb of happiness, dedicating it to Aphrodite, the goddess of love, fertility and beauty. Garlands of marjoram were placed on the heads of newly-weds as a symbol of love and honour. It was also employed as a funerary herb by the Greeks to promote restful peace for the deceased. References to marjoram appear in Banckes’s Herbal, which is believed to have been the first ever herbal book printed in England in 1527. In this ground-breaking book it was reported that, ‘It hath vertue of comforting, of loosing, of consuming, and of cleansing.’ Sweet marjoram was recognised as a valuable medicine with antispasmodic, digestive, decongestant and sedating properties and would be used successfully until modern drugs replace its use. To produce sweet marjoram essential oil, the herb is cultivated in Egypt, France, Germany, Hungary, Tunisia, Spain and more recently in the USA. In the south of France, harvesting usually takes place between August and September when the flowers are in full bloom. After collection, the herbage is dried for several days and the stems removed before charging the still. Sweet marjoram essential oil is obtained by steam distillation, which produces a pale straw or yellow coloured essential oil with a warm and herbaceous, woody-spicy aroma with subtle backnotes, a little reminiscent of tea tree, cardamom and nutmeg. Used in aromatherapy, sweet marjoram essential oil excels in massage for muscular aches and pains, muscle spasms, arthritis and rheumatism. It’s warming, soothing action brings almost instant relief to all muscle and joint conditions. In common with most oils extracted from culinary herbs, marjoram oil is effective for digestive problems, intestinal cramps and irritable bowel syndrome. Remember you must always massage in a clock-wise direction when treating anything to do with the digestive system. 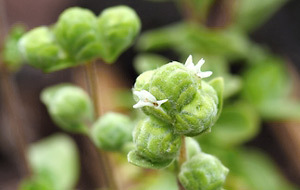 If you suffer with cramps during menstruation, try a hot compress with a few drops of sweet marjoram for quick relief. 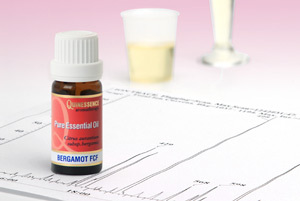 Used as an inhalant oil it helps to clear sinuses and a stuffy head, as well as easing asthma, bronchitis and catarrh. A few drops on a tissue can really help to soothe a tickly cough due to its highly effective antispasmodic action. When used this way sweet marjoram also has a calming action on the nervous system, helping to dispel anger and stress. Sweet marjoram essential oil is an effective relaxant, and is therefore an excellent oil to use if you suffer from insomnia or have trouble winding down after getting into bed. Put a few drops in a warm bath before bedtime, and if you have a vaporiser try burning it in the bedroom before retiring. The warm and soothing fragrance is perfect to lull you into restful sleep. If you find you need something even stronger, blend it with clary sage for a truly relaxing experience. Sweet marjoram oil is classified as a middle note, and blends well with a wide range of others including bergamot, black pepper, cedar atlas and virginian, roman chamomile, clary sage, cypress, lavender, myrtle, rosemary and all citrus oils. Be bold with your blending and go with your instincts because this is one aspect of aromatherapy that can only be learned by hands-on practice. Sweet marjoram is essential oil is great for adding a nice herbaceous, spicy note to any blend. Origanum is a Greek word meaning 'joy of the mountains', derived from the union of 'oros' (mountain) and 'ganos' (joy), or possibly from the Greek word 'origanon'. Majorana comes from the Latin 'major' meaning greater - a reference to the ancient belief that the herb could increase the lifespan. Top: Sweet marjoram buds developing, just prior to the flowers beginning to open. Above: Several weeks later I revisited the crop to study and photograph the developed flowers, before the crop was harvested.